Hello! 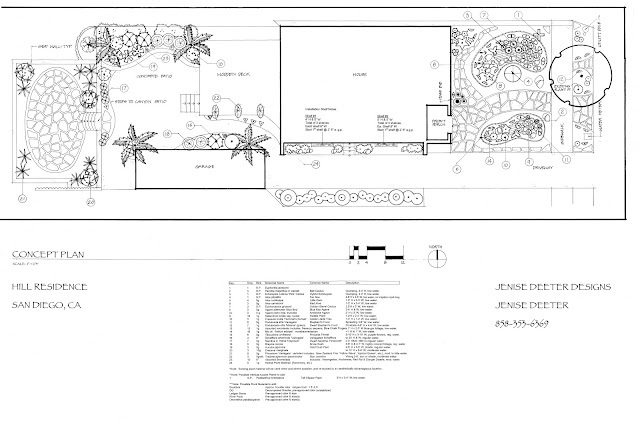 This is where we will share photos of some of our landscape design projects located throughout California. Deeter Buckner Design LLC and The Plant Man are based in San Diego, CA. Our design/build team consists of Michael Buckner, aka The Plant Man, Jenise (Deeter) Buckner, and Conrad Scouton, our hardscape specialist, general contractor and builder (of whatever you need, newly built or remodeled). License #946212. Design Phases: Consultation, Site Plan, Concept Plan, Installation and Build. Our design work enhances the outdoor living space by promoting unique, expressive, drought tolerant and sustainable landscapes. The landscape designs reflect the client's personal narrative...their visions, dreams, and expectations throughout the processes. A 'constant' in our design process is to be 'Nature' sensitive. Our objective is to bring 'Nature' into the design, to include the natural qualities inherent to Southern California and it’s ‘micro climates’- its native rocks, its changing elevations, the unique climates of its canyons, beaches, & interior desert environments. · Michael Buckner, born and raised in San Diego, has been both a nurseryman, and a landscape designer in Southern California for over 40 years. His design work has been featured in San Diego Home & Garden, Pacific Horticulture, books by Debra Lee Baldwin, and multiple other magazines and newspapers. · Michael is a nationally 'Certified Judge' for the Cactus and Succulent Society of America, a horticulturalist, a grower of rare and exotic plant materials, a sought after speaker, an avid student of natural history, and a bibliophile. · Jenise (Deeter) Buckner holds degrees in both Landscape Architecture and Fine Art (MFA, Masters of Fine Art). She taught drawing and black & white photography at SDSU for three years, while earning her masters degree. I'm particularly excited about this recently completed residential design which includes a full spectrum of plant material - from cacti, succulent, and Mediterranean to semi-tropical plant material. The landscape in the front garden area is designed as a colorful, show-stopping water-wise succulent garden. The back garden areas stretch out on three different levels from east to west. The upper level wooden deck gives access to the 2nd level concrete patio with serpentine seat walls surrounded by various planting areas, and plenty of open space for some beautiful designed container gardens. The third level is a marvelous flagstone patio garden which literally reaches out into one of our city's gorgeous canyons, populated as they are with a collection of both native and volunteer plantings. Naturally all the backyard garden areas have amazing views! The gracefully articulated levels of outdoor living space invite both, the idea of a garden party, or a more intimate moment of individual communion with Nature. All that's required to fully set the stage are some well-chosen, incredible plant material - and the design will make that happen. This has been a fabulous project to be a part of! I'm Jenise (Deeter) Buckner, and a partner with Deeter Buckner Design, LLC (originally Jenise Deeter Desgins). My desire to do landscape design grew out of creative passion; a love of art/design, and working on the land with plants and people. I'm also an artist - degrees in Landscape Architecture & Masters of Fine Arts. I returned to school to study Landscape Architecture after 8+ yrs in the nursery business, with a love of nature (childhood, 2,000 acre farm in ND) and a art and design background. My degree in Landscape Architecture provides the tools I need to create concept plans designs (on paper) of original sustainable water-wise landscapes, creative enhancements of outdoor living spaces. Studies/Degrees: M.F.A., Masters of Fine Art, San Diego State, A.S. Landscape Architect, Mesa C. College, San Diego, and Narrative Film; and Storyboarding at Art Center, Pasadena. I taught college art (drawing and mixed media) @ SDSU while a grad student. I also taught B&White Photography under Walt Cotten @ SDSU. After graduation, I exhibited contemporary art and short films in San Diego and Los Angeles. People trying to contact Michael Buckner the Plant Man. NO EXISTING IRRIGATION FOR THIS SUCCULENT GARDEN!! Cactus & Succulent Gardens at Their Best! New Website Coming Very Soon!! The Plant Man San Diego. The Marlborough Drive Garden - Kensington, SD, CA. This garden is featured in the newly published 10th year anniversary issue of 'Designing With Succulents', by Debrah Lee Baldwin! Copyright 2013 Jenise Deeter. Simple theme. Powered by Blogger.